In addition to being an audiobook distributor, Audible is also a publisher. Its burgeoning original content dept has been producing podcasts, and Audible has also produced audiobooks with radio show quality sound effects, but nothing compares to the half-hearted attempt at a virtual reality experience which was developed for Joe Hill and Gabriel Rodriguez's Locke & Key. 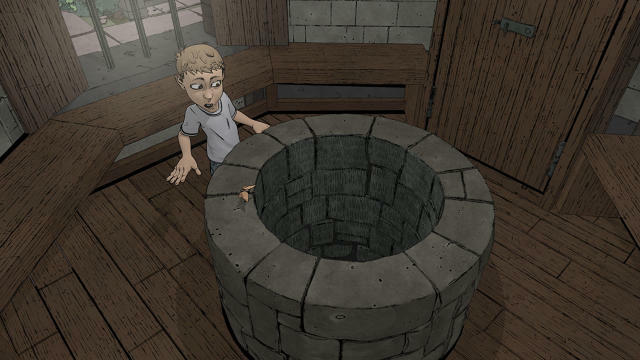 Originally published as a graphic novel series, Locke & Key is by its very nature not your average audiobook source material. In fact, one would assume that it's impossible to turn a graphic novel into an audiobook. You would be wrong, but Audible did have its work cut out for it. And that is why Audible partnered with digital creative agency Firstborn to create an immersive Locke & Key virtual reality experience which, according to Fast Company, was released last week during NY ComicCon and uploaded to Youtube as a 360-degree video. Or at least that is what FC is saying; the 83-second video on Youtube doesn't actually show much of a story. But from what I read on Techtimes, this video is exactly what was shown to the NY ComicCon attendees. You can find Locke & Key as a more traditional audiobook production on Audible, where it's free until 4 November. The audiobook is thirteen hours long. The virtual reality experience requires an Oculus Rift or some other most of us don't have. That pretty much torpedoed any chance Audible had of turning a profit on this project, but that hasn't stopped them from touting the tech. "From the beginning, Locke & Key was conceived to truly immerse listeners in the terrifying world created in the graphic novels, thanks to a cast of highly skilled actors, a soundscape that envelops you from all sides, and an original musical score, the audio drama succeeds in doing just that," Audible SVP Barbara Ward Thall told Fast Company. "Given the 360-degree sound design, we thought it only made sense to bring a scene from Locke & Key to life in VR. The fact that the audio drama was scheduled to launch the same week as NY Comic Con gave us the perfect opportunity to share this ambitious and exciting creation with some of its most ardent fans." It doesn't sound like Audible plans to complete the work, making this little more than a gimmick. Virtual reality is cool again and content companies are throwing money at it. Hulu (among others) is working on it go develop original content viewable by putting on bulky headsets holding your cellphone. They even have virtual living rooms where you can watch… regular 2D Hulu programing. The only one of these headset systems I’ve seen that shows any practicsl promise is Hololens and that is a decade from maturing. By which time MS will have moved on and somebody else will market a watered down version as the latest and greatest. Yes, but I don’t know that Audible should be included in the same group as all those other fools. Audible’s limited project was more of an engineering test (which was then used as a marketing gimmick). A one-off project like this is can be worth the investment just to test the idea.